10/28 Update: Couldn't attend? Read the transcript or watch the event at www.NextGenWeb.org. 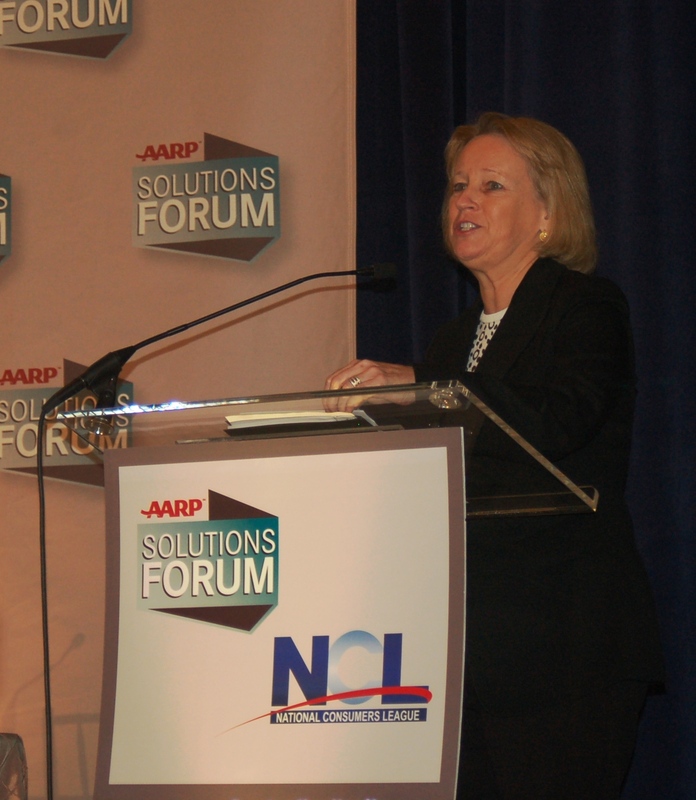 By John Breyault, Vice President of Public Policy, Telecommunications and Fraud U.S. Securities and Exchange Commission (SEC) Chairman Mary Schapiro headlined a stellar group of panelists at Thursday’s AARP Solutions Forum on Fraud, which was held in collaboration with NCL. We were especially pleased to hear the Chairman say that the SEC will soon be focusing [caption id="attachment_821" align="alignright" width="261" caption="SEC Chairman Mary Schapiro at the Oct. 22 AARP / NCL Fraud Forum."] [/caption] its efforts on a review of dodgy retirement products being sold to seniors. “America’s future retirees deserve products that they can understand and evaluate,” Schapiro said. “This means that complex fee arrangements or product descriptions should be discarded in favor of simple, clear disclosure. Our future retirees should have access to products that will help them meet their retirement goals without imposing inappropriate risks.” The Forum brought together more than a dozen experts on fraud affecting the biggest investments that most consumes make: their homes, their cars, and their retirement savings. Marietta Rodriguez, Director of National Homeownership Programs at NeighborWorks announced that on Monday, October 23, her organization will be launching a new Web site designed to “empower homeowners to protect themselves against loan modification scams, fund trusted help and report illegal activity to authorities.” The site will be available in FIVE languages to help those consumers whose first language is not English avoid falling victim to these scams. On a panel examining the threat of used car scams, John Van Alst of the National Consumer Law Center (whose report on used car scams is required reading) examined issues such as “yo-yo sales,” excessive and discriminatory dealer mark-ups, and the need for state laws prohibiting “as is” auto sales. Len Bach, a volunteer with the AARP Free Lunch Monitoring Program was one of the highlights of the third panel of the day, entitled “Fighting Investment Fraud: Fostering Compliance and Assuring Enforcement.” Mr. Bach, who has attended nearly a dozen of these seminars in an effort to root out hucksters, urged seniors who attend these events to “take the meal and split,” rather than engage with the scammers in the “critical” second meeting. While the tone of the free lunches is usually “laid back,” the hard sell from the scammers comes in the second meeting, often in the senior’s home, where the scammer tries to sell them on often-fraudulent investments. Andres Castillo, also of AARP, discussed AARP research showing that contrary to how they are often advertised, 100% of the free lunch seminars involve a sales pitch. The highlight of the day was Chairman Schapiro’s remarks. Before an audience of approximately one hundred attendees, she discussed a range of issues pertaining to the SEC’s role in fighting fraud. She reaffirmed the Commission’s commitment to rigorous enforcement against scammers, discussed the reforms the agency has taken in the wake of the Bernie Madoff scandal, and announced a new investor education Web site – www.investor.gov – which launched on Thursday. A full copy of the Chairman’s prepared remarks is available on the SEC Web site. Video from the event will soon be available at www.nextgenweb.org.